Sterling Moore is a cornerback for the New England Patriots, and as it is the offseason, Sterling Moore went to Las Vegas. Sterling Moore had a fun time in Vegas, as athletes and non-athletes often do. Perhaps there was gambling, maybe women or alcohol, or even Cirque Du Soleil. Whatever his recreation of choice, Sterling Moore wanted to get across the notion that he had a fun time but was also tired. So to all his friends on Twitter, Sterling Moore announced that he left Vegas "in a wheel chair." Then he said it again. Ha ha! This was funny because Las Vegas is a place where one can have so much fun, it could conceivably leave one crippled! But some journalists who don't have Sterling Moore's sense of humor saw these Tweets. "Wheelchair?" they said to themselves as they put their press cards into the bands of their fedoras and prepared to report. "What's all this about a wheelchair?" Because if an NFL player was in a wheelchair, that might interfere with his ability to play football. Walking under one's own power is almost a prerequisite to be a pro athlete, let alone one for the Patriots, who are a good team and like their players to not be in wheelchairs. So these journalists called Jordan Woy, who represents Sterling Moore. Woy was confused too! He had heard nothing about his client being in a wheelchair. This would certainly affect his client's next contract negotiations, as well as his own cut. 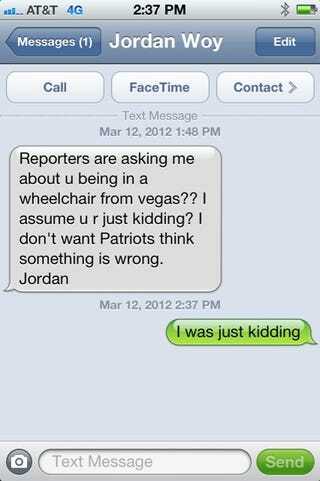 So he frantically texted Sterling Moore to find out what this wheelchair business was about. The result is above. Oh, Sterling Moore. You were making jokes, but some people didn't realize they were jokes. You got them again, Sterling Moore. Wait, though, I just want to make sure. Are you in a wheelchair? Okay, good. Ha ha, I get jokes!